Land at Heidelberg, 14 km north-east of Melbourne, was sold by Crown auction in 1838, making it one of the earliest rural allotments. (Central Melbourne’s first land sale was on 1 June, 1837). By 1840 there was a surveyed township named Warringal (Aboriginal for eagle’s nest). Warringal gave way to Heidelberg, a name applied by a land agent after the town in Germany. Heidelberg was reached by a track from Melbourne via North Fitzroy, and in 1841 the Heidelberg Road Trust was formed. 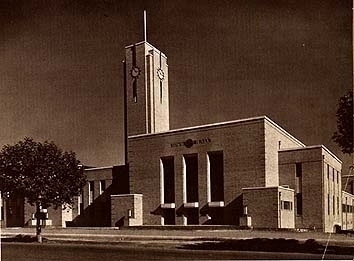 As a form of local government it preceded the Melbourne town council. By the late 1840s the road had a toll bar at the Merri Creek, and a macadamised surface. It became a tourist attraction, enhancing Heidelberg’s reputation as a desirable place for views, excursions and rural estates. Cattle overlander Joseph Howden had built his Gothic Banyule homestead in 1846 overlooking the Yarra Valley. 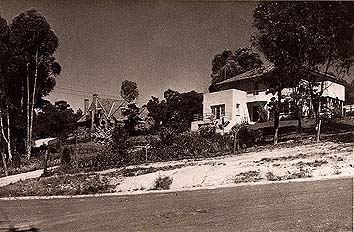 Until the 1960s the Heidelberg municipality extended into Northcote on the west side of the Darebin Creek and northwards until 1964 when the semi-rural North Ward was severed and made the Shire of Diamond Valley. The appealing rural scenery had attracted artists in the 1880s, not least because the absence of public utilities and a railway (until 1888) caused houses to be vacated and available at low rents. The plein air school of painting from Box Hill rented a cottage at Eaglemont in 1888, culminating in the “Heidelberg School” of Australian art. Two years later the Chartersville homestead was occupied for similar purposes. The views from Mount Eagle and across the Yarra Valley were especially impressive. By the 1970s the residential development of the Heidelberg municipality was complete but for some areas in Viewbank or Rosanna East. The shopping areas were mostly of the typical strip kind, but an early (1956) free-standing centre was built in Heidelberg West, to a design by the Housing Commission which drew on American trends. 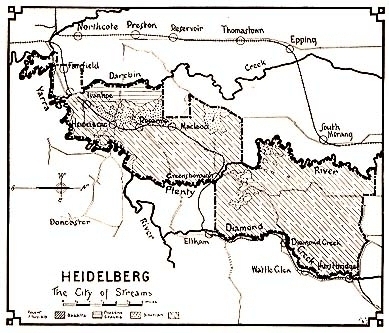 The population of the Heidelberg municipality (before the severances in the 1960s) was 8,610 (1911), 34,401 (1947, excluding Greensborough), and 60,007 (1961). The population in 1991 was 60,468. On 15 December, 1994, most of Heidelberg City was united with part of Eltham Shire to form Banyule City. Garden, Donald S., “Heidelberg: The Land and its People 1838-1900”, Melbourne University Press, 1972. “Heidelberg Since 1836: A Pictorial History”, Heidelberg Historical Society, 1971. Topliss, Helen, “The Artists’ Campus: Plein Air Painting in Melbourne 1885-1898”, Monash University Gallery, 1984.